The Locusts Have No King, Dawn Powell, Steerforth Press, 1998, ISBN 978-1883642426, 286pp. This was another book from Michael Dirda’s list of 100 Best Humorous Books in the English Language, and another one that I enjoyed reading, but not so much for any comedy. I’d chalk it up to a difference of definition of what humor is, except so many of the books on Dirda’s list that I had read I totally agreed with in regards to comedic intent and result. If anything, the list has got me trying books and authors that I had never heard of before. What I did like about Dawn Powell’s The Locusts Have No King was its portrait of literary life in New York City in the middle of last century, with its strange mixture of social and economic classes. The novel centers on the love affair of Frederick Olliver, an academically inclined writer of histories, and Lyle Gaynor, one-half of a married pair of playwrights with some recent success on Broadway. Lyle refuses to leave her husband, an invalid who depends on her partnership, and Frederick is too besmitten to insist on it. When a strange girl called Dodo attaches her social-climbing self on to Frederick just as he is heading to a society party that Lyle has insisted he attend, this delicate cocktail is upset, and the lives of Frederick, Lyle and everyone around them is changed. This is a character-driven story, as the plot is easily summarized. Powell switches her point-of-view between the two main characters easily, and some of the frisson of this novel is how Lyle or Frederick so easily misunderstand the actions of the other (a staple of many comedies). I felt these situations, however, generated more pathos than bathos, as I felt sorry for these characters rather than bemused by their stubbornness. Maybe that’s because I empathized too much with these two social-crossed lovers. Dodo, the “pooh” girl (called so for her tendency to call her beaus sticks-in-the-mud with the cry of “oh, pooh on you”), is almost as annoying as Fran Drescher’s Nanny character, as you can almost hear that nasal voice in every piece of dialogue, and as Frederick becomes in turn besotted, obsessed, and disgusted with her, so does the reader. 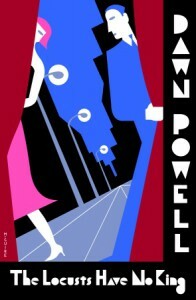 Overall, an interesting novel, but not enough that I want to immediately check out more of Powell’s writing.